She needs the 900 hPa Sandy on her Georgia state. Would love to see her caught out in that. That's all the diplomacy I can muster for this particular fraud. "Judith Curry has an article about the storm (archived here). According to her accounts, the weather bureaux gave the odds at 30% "
I'd be curious to know, what were the forecasts, really? Given Curry's well-established record of not doing her homework I won't buy her 30% figure unless there's independent confirmation. Is there an archive of old forecasts somewhere? Don, that was me being a bit sloppy, not Judith. Sorry about that. It wasn't central to my discussion. "This is distressingly similar to Hurricane Sandy, of course. A major city, along with the state in this case, in spite of direct communications with the National Weather Service, is unable to put the pieces together to understand the RISK to their citizens. Risk implies uncertainty, and understanding it is at the heart of decision-making. Let’s say the chance of the storm producing 3 inches of snow was 30% on Monday, which sounds about right. The Georgia decision-makers didn’t understand that a 30% risk of a cataclysm requires major affirmative action. You can’t wait for a guarantee. 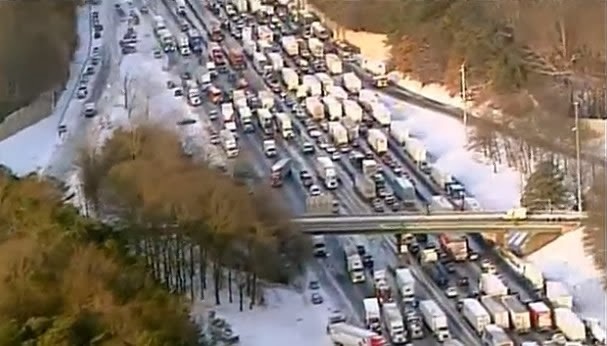 "How about a 20% chance of tens of thousand of people being stranded on the highway in freezing temperatures? Is that enough for a governor or mayor to make the decision to tell people to stay home? It’s not easy, but it’s not rocket science. Mostly, you have to understand the ingredients that have to come together to create a disaster in your city. (See formula above.)" You would think with all her concern about "uncertainty" that Judith Curry would have been pressing Congress hard for additional funding for climate research, for more comprehensive observation networks and improved modeling capacity to reduce some of that "uncertainty." electricity from geothermal power or wind power or solar power. The ... notion makes some people go bananas. How much geothermal energy is being generated at the moment? And what about the cost of overcoming the intermittency of wind? How much solar power is produced in Atlanta at the moment? Renewables are expensive and limited, that's why it still only produces a fraction of capacity, why there remains a massive block to their widespread use. Failing to acknowledge the whole argument, cherry-picking the sugar-coating and ignoring the downsides, is engaging in denial and disinformation. funny, I live in VT and just looked at installing solar. It looks like it would take a little over 10 years to cover the costs, but much of that is because of the expense of getting the conduit to my electrical board. I wonder what the cost will be in 5 year. Tony, the economics of domestic solar PV are more complex than that. Basically it looks reasonable to you now because you are not factoring the cost of maintaining the grid connection to your home. Try calculating the cost of solar (including batteries, gas for cooking, etc.) if you disconnect entirely from the grid. You will find out how much it would really cost to reduce emissions with large-scale solar PV. In 50 years, young people would wonder why so many were unable to make simple calculations of energy payback. The might also wonder why we were so afraid of nuclear fission. Tony, you may find this website useful for working out how much you can generate. It started in Australia but now has data from home installations around the world. All user input. The Weather Channel had a lot of coverage of Atlanta's plight. I background-followed a lot of it, but only once, at the end, heard mention (other than the heavy traffic) of how freezing rain might cripple the freeways. Atlanta has a lot of hills. Great post Sou! A great unmasking of Curry.